I liked Thor: Ragnarok, it was really fun, but I did feel like it tried a little too hard to be funny, at times. There were a few times where I would’ve liked them to pull back on the humour a bit. But still, really fun, and Hela was wicked, and the censored moment did actually bring a tear to my eye. On Claremont leaving: I will say I tend to side with his stance on letting things change. My biggest problem with the franchise, over the past few years, has been its reluctance to really change. Especially right now, it leans SOOOOO hard on nostalgia and the past. You mention the ’90s cartoon early on, I figure it’s worth mentioning the new book about that series. 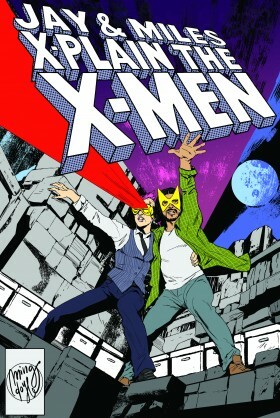 “Previously On X-Men,” by Eric Lewald. 1. Get a Sharon Carter figure, they are only about $10 on Amazon, her S.H.I.E.L.D. jump suit is pretty much identical to Pryor’s flight suit. 2. Remove the head, and paint the figure (with acrylic paint, it won’t rub off and oil paint takes WEEKS to dry) a brown-green (or whatever color you prefer for her) with black boots (length is up to you but we went for knee-highs). Annette O’Toole. You can check E-Bay for loose heads if you do not want to get the 2-pack, but we’re X-MEN fans so the $25-35 cost for the 2 pack is not much more than the loose heads would sell for anyway, and both Cyclops and Dark Phoenix look great. 4. Pop the Jean/Phoenix head of your choice on to your painted (and hopefully dry) Sharon Carter body and BAM! You have your own custom Maddie figure with very little artistic skill required! Change the course of her marriage or add her to your Outback X-MEN squad (there are figures for all the rest now), or create your own adventures for this wonderful character MARVEL editorial kinda… well, fucked up and swept under the rug. Well, hope this was helpful to any other fans of the show that are also toy freaks like me! We had fun making our Maddie and think she looks amazing, and since the chances of her getting her own figure are slim to null this little, easy, simple custom job is the next best option. P.S. There is a DC Select Ra’s al Ghul figure that is shirtless that easily turns into a Sebastian Shaw figure with a little paint and super glue for the ponytail. I think if Magik brought Crazy Taxi back from the future for Amanda Sefton, she would have brought System Shock 2 for Shadowcat and kept Half-Life for herself. Eye-contact initiated dog-fights occur absolutely everywhere in Pokémon, yes, but it at least started out slightly better. The first games didn’t have breeding, which in my opinion turning the franchise nearly into a Mr. Sinister simulator. That said, part of the fun of Pokémon is team-building, and that crosses over into making up imaginary comic book lineups. Here’s one team which should work well enough for playing the single-player quest. I have no interest in making a team for competitive play because the metagame’s goal is to remove any attachment to characters nearly as quickly as a Doctor Doom vs. Batman argument. I’m going to assume the Generation 1 type chart is in use. This also means that Psychic types are objectively the best, so let’s assume this single-player campaign occurs during the Silver Age. Psychic-types will be fairly rare except for the difficult to find Vanisher just outside of Cerulean City. The Ice/Water-types encountered later on will be far more versatile than the initial Iceman, unless you put in *so much* time and effort he becomes an Omega level mutant. Therefore, some of these picks will have to be found later, and the player will just need to use 3 or fewer mutants beforehand. This also means you do not waste effort on a mutant which is decent at first, but clearly outclassed later as is often the case with Bug types (Maggot). Sunspot is our starter New Mutant, and if you like, a later evolution turns him into Fire/Flying. Polaris has an optional evolution to a Fighting type if you trade her to a friend’s cartridge while you’re in the Savage Land. Most people just let Blob return to Lubbock, Texas, but you can convince him to join you after you wake him with the X-Flute. Finally, Rachel has *so many* possible evolutions. Marvel Girl, Phoenix, Prestige… you get a lot of options and can often change back to Phoenix again. While this team is only 5, and you could find and train a 6th, you’re spreading your XP rather thin at that point. You’re just hoping they survive the experience… gap. I realized, while this team does fairly well in regards to type matchups in a Gen 1 single-player quest, Pokémon games are filled with places where you must learn moves from Hidden Machines or you will not be able to progress. I’m comfortable with Sunspot or Blob learning Strength, so boulder pushing puzzles will not be an issue. Flash can often be ignored by stumbling around in the dark, but since this is the Silver Age, let’s say Polaris can learn it. While Grass types can often bafflingly learn Cut, I have the feeling Wallflower would not be capable of that feat. Certain evolutions of Rachel might but she enters the team late-game and small bushes are often an early game obstacle. Furthermore, no one on this team seems capable of learning Surf. Ideally, we will be able to find one team member who can take the 6th slot occasionally to perform both of those tasks, but not actually be part of the team otherwise. Who can both Cut and Surf? The choice is obvious: Adam X. With the discussion of how WHEN we get introduced creates our definitive version, I keep coming back to Spider-Man and his Amazing Friends. That wa sky first introduction to the team and husky-voiced “Sprite.” The first comic I bought was Uncanny 193, largely because I recognized Thunderbird, Nightcrawler (still my favorite), and Firestar. Did I miss the podcast when the Spider-Man episode was discussed? wanted to try and no prize the Banshee/Siryn powers working on each other issue. Banshee and Siryn are manipulating sound waves with their vocal cords- once those sound waves are out in the world, they work as “normal” sound waves do in the 616. they’re able to keep themselves aloft and shatter things through deft manipulation, but it’s not the same sort of deal as energy blasts from a Summers brother or Telekinesis from Jean. It’s still sound, still vibrations in the air, and you can’t really be “immune” to that phenomena. Like when Storm manipulates the weather- it’s still the natural weather. there’s no being immune to the wind and the rain. Storm’s fictional cousin Tempest…err, Squall…uhhh Cloud?..nope….Fog. sure. Storm’s fictional Cousin Fog would still be affected by Storm’s powers, because Storm isn’t creating an energy source, she’s pulling the strings on the natural world. Similarly, Banshee and Siryn are just creating powerful vibrations in the air and there’s no real “being immune” to that, just as Illyana wouldn’t be immune to Colossus picking her up and juggling her with his strength. The problem there is that someone else is immune to Banshee’s powers: Black Tom. Actually, they’re immune to each other’s powers. As much as I hate to bring it up, Black Tom gets the chance to blast Siryn (Siryn does not get the chance to reciprocate) in the X-Force & Spider-Man crossover, “Sabotage,” and it worked. I would rather forget that crossover exists, but the simpler explanation would be that Siryn isn’t related to either of them/was an imposter with her powers. The simplest explanation, of course, was given by Miles in this episode. okay, let’s tweak my basic approach- the particular panel is about Banshee’s flight getting cancelled out, right? so they can affect the sound waves being used to keep each other aloft but can’t directly attack each other? Not touching the Black Tom Siryn part, mind you. alternatively, it’s just a comic book, we should really just relax. Theresa’s power is a mutation of her dad’s, so it could be that the Shadow King thought of a way of remodulating Evil Siryn’s scream so it’s no longer in sync with her father’s as it would be under any normal conditions. I just started reading a Generation X trade paperback which includes X-Men #36, where the Phalanx adapt to powers like the Borg adapt to technology and the frequency of Banshee’s sonic scream is treated like remodulating a phaser. Then the Phalanx has some very peculiar phrasing, including missing punctuation. The Phalanx could have just wrung his neck or smothered him (the panel could be interpreted as the latter), but no. I think you’re almost there. Banshee flies by catching his own reflected sound waves; by carefully modulating her own sound waves to match, Siryn could superimpose the waves to either double or null out the sound waves Banshee was riding, thus either throwing him back or causing him to crash. That’s really interesting because that means Banshee isn’t immune to his own power, while Black Tom is. Imagine if Havok was immune to Cyclops’ blasts but Scott himself wasn’t. And if Sean isn’t immune to his own power, Syrin having ostensibly “his” power would mean his NOT being immune to HERS almost correct. Not at all, unless you assume that Banshee’s immunity extends to the clothing he wears. Immunity means he isn’t harmed by his own screams, but he’s not completely insensitive to them; he can echolocate, for example, by hearing his own sound. Similarly, the big cape-wing bits on his costume are designed to catch the returning energy and lift him into the air. I’m just suggesting that since that lift IS coming from compression waves, Siryn could affect the lift he gets by interfering with those same waves. He would not be harmed by Siryn’s powers, but crashing into the ground might hurt when she neutralizes his source of lift. And would Nightcrawler be unable to teleport Mystique? And would Rogue not absorb the life force of her parents? On a less serious point: Sean must have terrific shoulder and back muscles to be lifted by that cape of his. But I suppose Storm must as well. Storm basically flies by blasting a hurricane level wind up up her own backside and hoping her cape billows enough to allow her to steer rather than sending her into an incredibly inelegant spin/plummet. Aside from also drowning out her speaking voice (no wonder she declaims so much, it’s the only way she can be heard over the wind). I have never quite been able to view her flying as majestic or elegant since I had that realisation. Storm doesn’t require the cape to fly. Bloodstorm doesn’t have one right now in X-Men: Blue. That could be due to being a vampire, though. Hmm. Wind Dancer in New X-Men: Academy X didn’t have a cape, but flew with wind. She also carried voices to and from her, “on the wind.” Until M-Day. Then she became Renascence and traveled by Doctor Octopus arms which also shot laser blasts. I have to imagine the laser blasts could be loud enough to drown out voices. Vampires without capes? Why would anyone do that?!!! It seems counter-intuitive I know, but if you’re cool enough, you don’t need a cape. Countering the vibration of air to get it to go in a different direction would be a hellofa trick, but I will say that insectivorous bats can and will use their own cries to “jam” the echolocation of other bats while they’re hunting the same prey. To bring more science into a discussion of comic book physics, if anyone is interested, Phil Plait just had an article on the Bad Astronomy blog (current home is on Syfy) covering lift. Episode 42 covered Firestar. There was some discussion of Spider-Man and his Amazing Friends in that episode, and the visual companion for it also has screenshots of Cyclops and Sprite in a Danger Room sequence and Thunderbird as a bear, which has also been mentioned repeatedly. But, it’s mostly about the comic origin story of Firestar. I could have sworn I was replying to BeezusRed, there. I believe that’s “Beyond Good and Evil” and is really the last good parts of the show. After that it gets… less good. I think I love the idea more than the execution, and the episode is good because of the past characterisations/interactions more than the actual episode itself. There’s a two parter where Cable has to come back and stop Bishop and the X-Men from stopping Apocalypse in order to stop a worse future, which is a pretty cool use of the whole Cable thing. My favourite episode isn’t great, but it’s the one where Iceman comes to the mansion looking for his girlfriend, Polaris, who has gone missing, but who is hanging out with Havok and the Peter David/Government team version of X-Factor. Just cool to see those uniforms and characters almost exactly like they are on the page (even if the episode is kinda bafflingly bland). Sunspot you’ve covered better than I could. So, is Charles Xavier’s Crotch at drinking game threshold yet? And more importantly, IS there a formal drinking game article somewhere? The wiki tracks how many drinks-per-episode have occurred in each episode, but full list of criteria. From Jay’s reaction I doubt it could be used as a drinking game without being seen as an encouragement to chronic alcoholism. In less disturbing news, the issue of a man with a metal skeleton trying to fly got me thinking. Do we know enough about the specifics of the weight of adamantium and the process through which Logan’s adamantium skeleton was introduced to his body to know if he might have hollow bones? Because, forget flying, if adamantium has a particularly high mass, just walking around would probably be difficult. Furthermore, hollow bones shouldn’t cause any structural issues given its durability. Of course, since bones do a lot more than just structure, not having actual bones could be a big problem. It also occurs to me that I’m taking the usual statement that Wolverine has an adamantium skeleton at face value, and that I don’t actually know if that’s accurate or if he has an adamantium-*coated* skeleton. I’m clearly on my way down a rabbit hole, so I’m going to stop before I’m never heard from again. But yeah, hollow bones. Good idea. Episode 114 (covering Havok & Wolverine: Meltdown) had a listener question in which Miles replied that Logan’s (and presumably Victor’s & Laura’s) healing factor turns adamantium into beta adamantium, which doesn’t inhibit biological processes. This is mentioned (without citation) on Marvel Database. It also mentions when Logan lost his healing factor but still had the fictional metal-bonded skeleton, the adamantium gradually poisoned him. Jay had mentioned Logan was sluggish in episode 99 when Wipeout removed his powers, but I believe they said the cause might have been because he was less capable of moving his frame. I have sometimes seen it claimed that Logan actually has super-human strength because his skeleton is so much heavier with adamantium (but not when it is removed). To my knowledge, hollow bones have only ever been mentioned in relation to Longshot, possibly Angel & Icarus. But I’m with you on bones doing more than just being a frame. Not having an accessible reservoir for calcium would mean you cannot move your muscles. Bone tissue is amazing. IIRC the adamantium adds an extra 100lbs to Logan’s 200lb bodyweight. He can’t float without assistance and I’m pretty sure he shouldn’t be able to swim for the same reason, though I’m sure he’s been shown to do so. Cue Logan wearing little wolverine-mask floaties. He could dive really well though. So she spent a long time under the influence of Malice, then got free after Inferno. Was she really free though, or was Malice just dormant? My thinking is that when Zaladone stole Lorna’s powers, that somehow “reversed the polarity” on the dormant Malice, and externalised the Malice Effect. So everyone around Polaris turns evil, and somehow Lorna’s body feeds on that negative emotion and turns her super strong. Hope it makes sense, because it’s the best I got. This sounds like an A1 No Prize right there. I’d love to see a writer take Malice and really pull on the strings like this. Test out the concept and push it as far as it can go. Malice being digital now can only help that. Plus it could give us a story with Polaris front and centre which is always great. Here’s hoping Marvel push her a little more now if Gifted does ok.
You can tell Fabian Nicieza has taken over by the nonsense overly-elaborate technobabble level shooting through the roof. Can’t resist commenting on the question of whether the X-men needed a reset or not at this point. I see it both ways — basically, I think you have to be more specific. So, for instance, turning Magneto back into a full-on villain. TERRIBLE IDEA. Claremont spent a lot of time slowly rehabilitating him into a more nuanced, interesting character. Future elaborations on that would have been great — it wouldn’t be that hard to find situations where he opposes the X-men for reasons which he thinks are good. Just flat-out undoing it was stupid, not just because it turned a really interesting character back into a shallow cliche again, but also because it makes his great redemption arc look more like an elaborate con. I mean, I can and do pretend that most of what came after didn’t really happen. But the internal logic of a continuous shared world says you cannot really do that. On the flip side, the introduction of X-Factor saw both titles make a lot of really unfortunate choices. (I think the apparent drive to have an editor-mandated X-wide crossover every year may have been a major source of trouble.) I think you can argue that (at the point this episode covers) the last really heroic thing the X-men proper did was die in Dallas. How many years did it go where the X-men effectively weren’t a team? So I think a re-grouping was desperately needed. It just should have been one that looked back to the core concepts behind the book(s? ), took stock of the interesting changes that had happened in the titles, and looked forward to find fun new places to take it all. I’m really sympathetic to Claremont’s position in principle. But I don’t know that his UXM work in the years leading up to his departure is the best argument for it, I’m afraid. Disclaimer: I gave up on UXM at some point not too long after Inferno, so my viewpoint now is probably colored by Young Me going through his early Vertigo phase. But reading along with the podcast hasn’t really given me much cause to regret Young Me’s decision to abandon my last X-book. The thing is, to me Claremont comes across as certainly wanting to try new things, but it’s on a fairly (not totally) superficial level. He wants to mix up things with different characters, adversaries, and home bases. But look: this story is stuffed through with skeevy mind control, and I think I’m on safe ground if I say that wasn’t new territory 🙂 It opens with an unnecessarily involved sequence devoted to aviation (and I think this is why the problem that our hosts pointed out arises, that there is no reason for Xavier to steal the Blackbird like this — I strongly suspect that Claremont wanted to write all the plane-related detail). Dialogue-wise, I’m afraid that I don’t think that Claremont pastiche waited for Nicieza. In other words, on the level of style and favorite motifs, Claremont is not showing, from my perspective, any particular desire to change. And for me, this has been the case for some time at this point. It’s like the rock star cliché of not wanting to revisit their early hits, if that rock star was still making music that sounded exactly the same, anyway. So, yes, I think that Claremont was right to want things to change. I’m not sure that at this point he was the right person to change them. And now a part of me imagines that, since Xavier discovered that Jean had never been dead, and that the X-Men had faked their death, that the only other two of his students who DID seem to be dead weren’t, and _nothing_ will convince him otherwise. Perhaps I’m alone on this, but the “aw, my students faked their deaths” thing seems to ignore the man had a statue built in Thunderbird’s likeness. Anyway, there was a ghost of Doug in Days of Future Present… I think. I have forgotten all of episode 152. Given that Xavier hired Changeling to impersonate him so he could hide, and then took advantage of Changelings _actual_ tragic death so he could hide even more, Charles erecting a statue for “the late (wink wink), lamented (nudge,nudge) Thunderbird” (as Xavier probably continues to describe him in conversation), would not be outside the realms of his ability to deny the death of his students. He’s probably just terribly impressed with how long James has been able to avoid detection. Thank you for the extra lengthy episode. This felt like a treat of another 20 minutes of quality heart-warming J&M shenanigans. I have another suggestion for a game – especially for those who still haven’t seen the new Thor movie: Try to guess and fill by yourself the gap of the *Bleeps* between Jay and Miles at the beginning of the episode. It could get really creative. I listened to it before I saw the movie and given we heard what sounded like the first letter of Jay’s question I would put decent money on me having immediately guessed the topic, because what else WOULD Jay ask about but….THAT moment? ?